The Here Be Monsters Festival features new play creation, performance and community development; as well as artist workshops, forums, mentorship, networking and opportunities for theatre artists to collaborate with artists of other disciplines. At Here Be Monsters, we realize that collective ensembles need a support system to explore challenges, share experiences, and learn from each other. 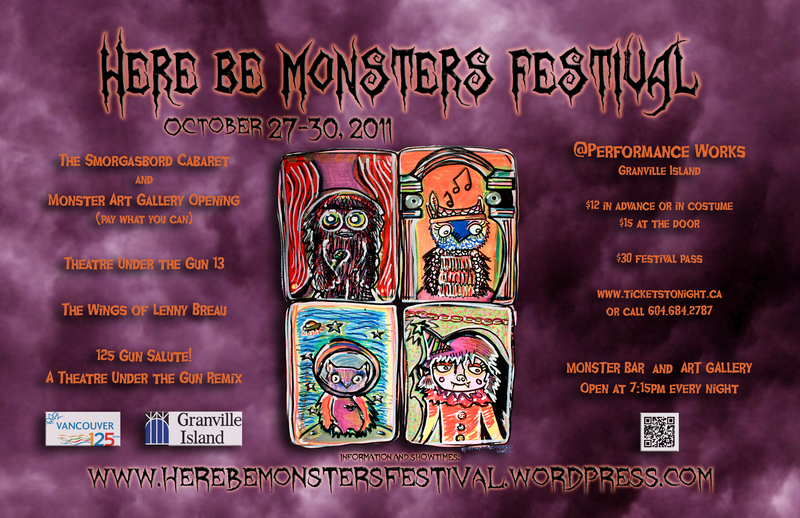 The Here Be Monsters Festival has established itself as a progressive platform for ensemble creation in Vancouver and Canada. In our 6th annual monstrous celebration of young performing and visual arts, six independent theatre companies will be put to the test to create one of a kind theatre in 48 hours in Theatre Under The Gun! As proud participants of Vancouver125, we have added a new element to the festival: Theatre in 125 hours! Three theatre companies and Theatre Under the Gun alumni will work together on a unique creation that will be performed on the of the festivities in 1 hour and 25 minutes. We will also be featuring other great Vancouver artists throughout the festival. See below for programming details! 7pm Art Opening | 8pm The Smorgasbord Cabaret with special guests e.s.l. The Monster Gallery Opening Art Reception & Smorgasbord Cabaret kicks off the Here Be Monsters Festival by celebrating all of the artists in the festival. Join us at our Monster Gallery Opening Reception, a showcase of the visual artists curated in this year’s gallery. The Smorgasbord Cabaret will be hosted by comedian Riel Hahn, the stage will include alumni artists such as: Jason Bryden with his further developed TUG piece The Surrealists: A Play; Jeff Gladstone with music samplings from The Wings of Lenny Breau; and closes with special guest band e.s.l. Theatre Under the Gun (TUG) is dedicated to inspire and facilitate performing artists in the creation of new theatrical work. We challenge theatre & dance companies to create original short performances under extreme time constraints. 48 hours before performance time, participants receive an inspiration package that they will use as the basis of their creation. These inspiration packages could involve anything from lines of poetry, a lightingspecial, a piece of choreography, a special prop, an image, a sound, a stage direction, etc. Once groups have received their inspiration package, they have 48 hours to create, write, rehearse and perform their creations. Let the games begin! Supported by CMHC Granville Island. A Public Workshop Presentation of Jeff Gladstone’s new script, The Wings of Lenny Breau. Presented in part with Theatre Conspiracy. Supported by the Canada Council for the Arts. 125 GUN SALUTE: A Theatre Under The Gun Tribute to 125 years of Performance Creation in Vancouver. As part of Vancouver’s birthday celebrations, we have added an entirely new event to the festival, 125 Gun Salute: A Theatre Under the Gun Tribute to 125 years of Performance Creation in Vancouver, a new play created in 125 hours. Supported by Vancouver125.